Stability is part and parcel of accuracy which helps to shoot your target better as well as more preciously through a rifle. A proper shooting rest provides enough stability and confidence to aim your target accurately at the range and also allows to change your position with a little setup instantly. Along with high capacity magazines, tactical rifle generally contains heavy pieces of stuff such as- pistol grip, telescoping buttstock, threaded barrel. Therefore, it becomes difficult for the shooter to control the body balance, especially when the rifle jumps backward during the shooting or firing. And so, best tactical bipods are used to provide proper rest and stability to this heavy loaded magazine rifles as well as to give strength to the shooter. Heavy weighted weapons such as tactical rifles are used for offensive or defensive purposes. So, holding a rifle on your hand becomes difficult to fire with consistent accuracy. Again, best tactical bipod gives you added stability for shooting either a rifle or pistol. Besides, this bench-rest also offers perfect height and pivoting function to take a good shot. It enables you to level the firearm quickly on the uneven ground and lock the legs into pre-defined notched position at your desired length. Its heavy-duty construction with hardened steel and aluminum builds confidence when you are behind a rifle. Some best tactical bipods also feature rotating or swivel attachment to obtain proper shooting through smoothly changing and adjusting angles of the rifle. It can provide support and stability through side to side and up to down motion with an easy installation process. This is a strong, compact and lightweight support for the tactical rifle indeed. Again, bipods are categorized as a lightweight, medium weight and heavyweight. In our review, we are going to discuss some finest tactical bipods from all the types that are best and available in the market. Harris Engineering is regarded as a favorite brand among the military, law enforcement, hunters and shooting enthusiasts due to its beneficial uses. The bipods of this brand are also considered as the most affordable bipods as well. If you are looking for a high-end bipod at least price, then Harris Engineering can be your ultimate destination indeed. Harris S-BRM hinged base bipod is a pretty light model that has the lake notches for certain elevation adjustments. You can swivel it back and forth as well as adjust the amount of swivel with a little screw. This screw increase the resistance to make it harder to turn. To install the bipod on your rifle, you have to take the Det quick detach connectors and push them through the center. Then, you have to attach the sling stud in the front of your rifle and tighten it down as well. This versatile 6-9 inch bipod is good enough to meet your target. It is preferable for pistol shooters. It is the hinge that makes it simple, convenient, versatile and reliable to use. Again, the spring loaded legs provide maximum stability, support, and quick leg deployment. The notched leg design and highest adjustable capability make it perfect for all shooting platforms including uneven terrains. This bipod is constructed with heavy-duty materials that remain stable under the weight of your heavy rifle. The body coated with a layer makes it enable to deploy in all weather conditions. The tension adjustment knob ensures zero tremors and looseness to your bipod settings. It also balances and stabilizes your weapon for the best shooting position. 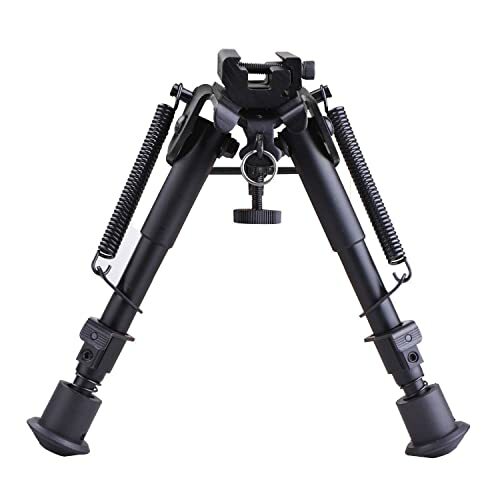 This hinged bipod with attach/detach design can be used in emergencies. It can directly and perfectly connect to the sling swivel stud of bolt action rifles. This bipod can be extended 6-9 inch, and the head can be turned an angle of 45 degrees. This turning head saves you while shooting off an uneven ground. In precision tactical applications where accuracy is needed, this bipod gets your rifle to the accurate shots. Overall, this bipod is the ultimate solution for accurate shots. Bog-Pod Camo Legged Devil (CLD) bipod is almost as stable as tripods. It provides greater stability to the rifle from your preferred height. The fabricated legs with high strength aluminum construction and the well-reinforced joints are the secret of Bog-Pod stability. The legs can be adjusted independently and locked into position through their rapid adjust level locks. The adjustment of legs supports out to a 40-degree angle. It also comes with Allen wrench tool for tightening and adjustments the legs. CLD-2 can be adjusted from 22 inches to 68 inches height standing position for shooting. Even, in the maximum height of 68 inches, there is no wobble or bending at the joints. The inch marks on the legs also help for quick set up. The head of this bipod is covered with rubber to prevent the damage of rifle forend and swivels up to 360 degrees. The rubber feet screw used to expose a steel tip to provide better grip on ice or other low traction surfaces. This universal shooting rest (USR) features all-terrain foot system as well. CLD-2 also comes with a shoulder strap equipped carry bag. This shooting rest with lightweight design can also adjust telescopes as well. Caldwell is one of the top brands who has ranked as a high-end bipod manufacture brand from a good number of years. It is a well-known bipod manufacturing company that provides various stable shooting platforms for almost all type of guns. Caldwell products come with attractive prices and high-end structures. XLA Pivot is one of the best bipods of Caldwell. Caldwell XLA Pivot offers a suitable shooting rest which can be attached to any firearm. This lightweight bipod is easy to deploy and attached with a rifle through the sling swivel stud. This shooting platform constructed with light but heavy duty materials. It offers pivoting functionality that helps to get an accurate and ultimate shot as you expected. XLA pivot bipod features adjustable as well as expendable legs that can extend from 6 inches up to 27 inches to give you high-end accuracy. Even the bipod is fully extended, you can make comfortable shots through this rest. The soft rubber base of the legs added extra strength and stability to ensure a stable position on the ground. 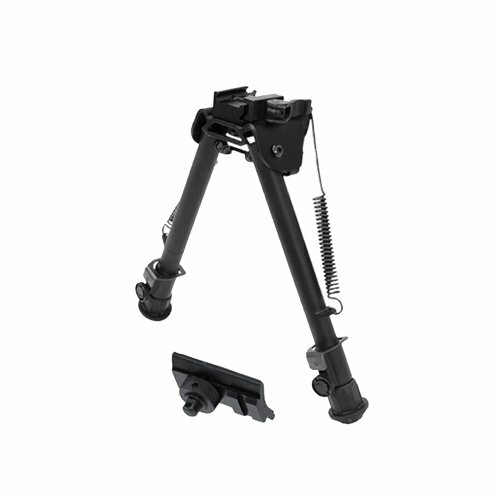 The sling attachment and multi-section legs connecting points allow folding the bipod arms by collapsing in a forward motion. And so, this bipod is convenient to use even with weapon attachment. The strong and durable aluminum construction offers a strong support to your firearm for a very long time. It is able to withstand the recoil velocity of your rifle as well. Again, the rubber pad base provides protection to your gun’s forend. 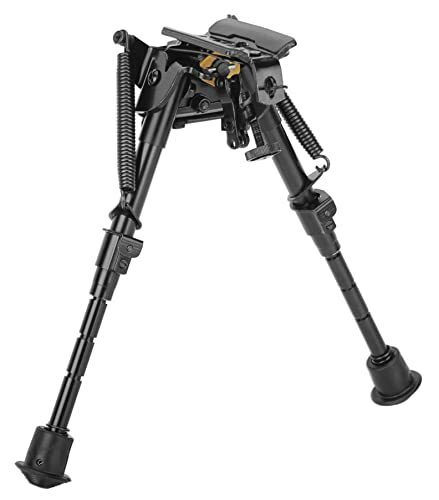 This bipod’s lower portion pivots can independently from on the upper mount platform or uneven ground. The adjustment knob allows you to adjust the level on the ground and resistance of the pivoting movement. It provides a level ground even on the terrain. This bipod can be your great companion to obtain nice and accurate shots. CVLIFE tactical rifle bipod is a stable shooting rest for hunting. The durable steel and aluminum alloy construction is the major quality that really explains why it stands out as one of the best bipods in the market. The quality and strength of this shooting platform ensured by the strong, fabricated and non-rusting black anodize coating body. The Picatinny adapter allows easy and perfect attachment to the picatinnyrail also. The upgraded mount tension screw with deep threads and high strength is able to withstand tension as well. Through 5 settings of the leg length adjustment button, you can adjust and lock the legs to any of the notches even in uneven ground or terrain. The foldable legs are convenient to fold with minimum noise. The legs also have rubber foot pad which is anti-skid and shockproof. The length of the legs can be adjusted from 6 to 9 inches. CVLIFE comes with unique features that take your stability and accuracy at a great level and ensure the right bipod shooting experience. The modern sporting rifle like AR-15 or AR-10 is best suited for this tactical bipod. Whenever it comes to the companies who make quality accessories for firearms, there UTG is undoubtedly one of them. UTG is one of the favorite brands for the bipod users who offers the finest quality shooting rest. UTG shooter’s swat bipod is one of the most versatile bipods among all the tactical bipods. It comes with an attractive design that provides incredible performance for a long time. The ingenious dual mounting system of this bipod makes it usable for almost all rifles. It can be used with broad range stock weapons also. 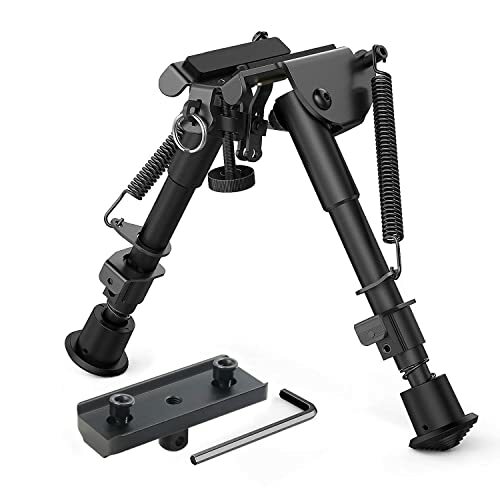 It comes with swivel stud mount as well as Picatinny or weaver mounting deck that offers an additional method for attaching a bipod to various guns. This bipod is constructed with durable high tech aluminum. This lightweight construction is strong enough to support the weight of any rifle. The legs can be adjusted to any length between 6.7 to 7.5 inches high. The spring-loaded mechanism of legs is suitable for deployment on any uneven terrains. The legs also can be folded out when it has no use. 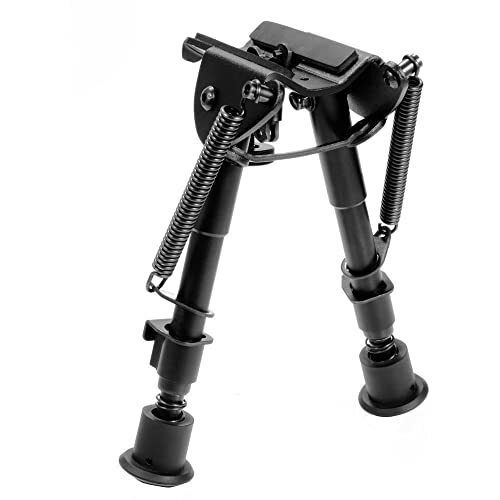 Swat bipod also features Posi-lock technology with a strong rubber stand to prevent tripping of your bipod. Another important feature of this bipod is fluid swivel function. This feature allows 360-degree fluid movement for your rifle when taking preparation for shoots. This bipod is ideal for both practice and hunting trips. This lightweight rifle rest is also easy to carry in your backpacks. It is best suited for pistols, shotguns and hunting rifles. To improve your shooting, this shooting platform is really reliable and affordable as well. UTG tactical bipod is one of the most favorite rifle bipods among the shooters. It offers a great range of height settings and allows folding back the with rifle’s barrel in a compact manner. UTG tactical OP bipod ensures the most important aspects such as strength, usability, and reliability. Shooters and outdoor sports enthusiasts admire the simplistic and straight design of this tactical bipod. This is definitely a worthy investment and a go-to choice for all the well-prepared shooters and outdoor sports enthusiasts alike. The robust aluminum construction provides the best performance in all-weather condition. This is a steel top platform which is resistant to tear and wear. This heavy duty full metal construction also meets the harshest requirements. 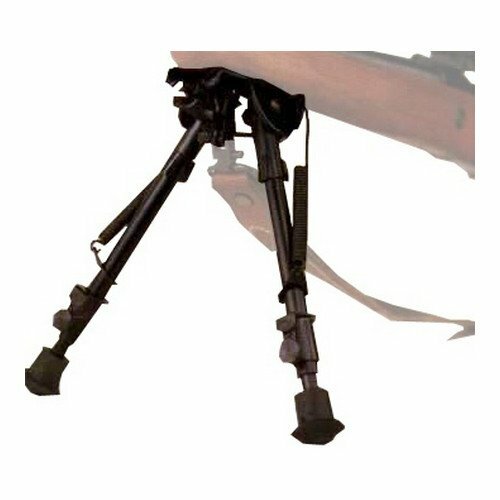 The double support rods at the mounting base, robust external springs integrated to the legs, and bigger diameter legs contribute to this superior bipod that can work consistently and tirelessly. Again, this aluminum construction with the steel components in strategic locations can conquer the most aggressive environments an afterthought. 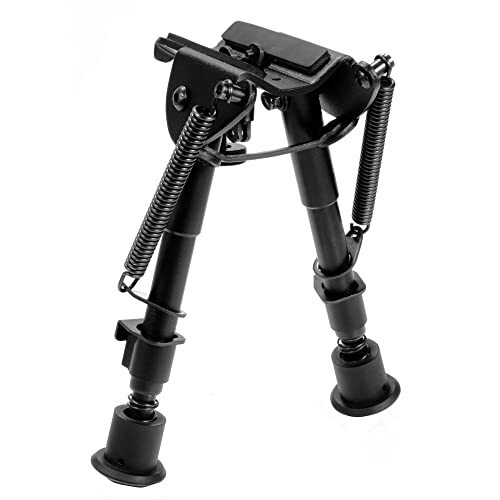 This tactical bipod features both Picatinny and Swivel stud mounts. The swivel mount height also can be adjusted through its extendable legs. It allows adjusting the rifles height perfectly through its flexibility. The mount base with adjustable QD lever lock can fit any Picatinny and Weaver rail. The independent legs can be easily deployed on the uneven terrain. The legs can be freely slid until you lock them. The rubberized feet can hold the weight of rifle even on the harder surfaces. The adjustable legs with 7 extension notches and lockable thumb wheel offer secured positions and support to your rifle. The legs come with finger friendly push buttons for rapid retraction of leg extension. And foldable arms also with robust external spring tension control. This bipod is also easy to carry with its foldable arms. You can use this quick detach bipod to your heart’s content. Ohuhu tactical bipod is another heavy duty bipod that offers a great platform with adjustable heights to the shooters. This is a compact 100% rust-proof construction to mount your weapon. It features an adjustable button to adjust and lock the leg length to any notches on the legs. The legs offer 5 leg length setting to adjust your legs. It also features a return springs which saves your time and effort to reset the legs. This bipod is constructed with heavy-duty steel and Aluminum alloy. The legs are fitted with rubber pads to provide stability and prevent slipping. The legs can be folded forward or backward for easy movement also. This new patent-pending design ensures that the swivel stud clamp remains in place for a stable attachment. The adjustable height & foldable arms with spring tension offers 6 to 9 inches leg height for shooting. This shooting bipod is insanely lightweight and heavy-duty to help you make the best out of your shooting. The streamlined design makes it convenient to use and anodized layer makes it fit to meet harsh conditions too. XAegis 2 in 1 bipod comes with 100% refund guarantee in case of user dissatisfaction. The heavy duty and hardened steel construction with non-rusting black anodized finish offers quick attach or detach from the rifle using a swivel stud. This is a compact and lightweight bipod that does not have a swivel top and does not tilt from side to side. The legs that come with spring return and rubber padded top offers 5 length settings to adjust your bipod length. Its foldable arms can be folded with spring tension. This adjustable bipod also comes with rail mount adapter, so you don’t need to buy another one. This is a great product for the mid-level hunter or shooter. The heavy-duty construction with nice base pads makes it an ideal bipod. 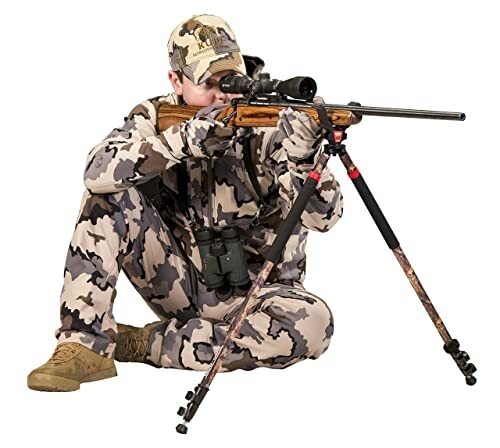 If you are looking for a best tactical bipod for hunting or want to take your shooting at the next level then there is no alternative than AVAWO hunting rifle bipod. 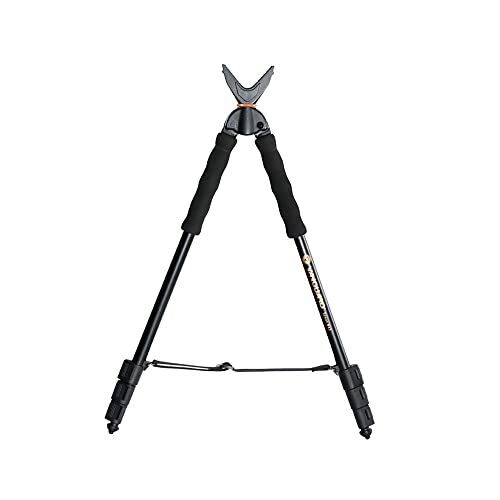 This sturdy and versatile bipod is made of heavy-duty aluminum with the hardened steel top. This versatile bipod delivers an ultimate shooting experience with utmost precision. The swivel stud mount makes easy to attach and detach rifle with it. The adjustable legs take no time to hold a better ground. This bipod conforms the ground really well. It has no swivel mount top, so the rifle won’t move from side to side to get the comfort position as shooter desire. But, you can adjust the heights for different shooting positions for a better shot. It offers 5 different leg length with return springs. The leg length can be adjusted from 6 to 9 inches. Again, the legs can be folded forward or backward. The easy release button takes seconds to get fire-ready and also fully closed fit to your backpack. Vanguard is a leading manufacturer of shooting accessories. Professional hunters and shooters rely on Vanguard for its quality, durability and wonderful designs. Vabguard scout B62 Bipod is one of the most rated shooting platforms for the field use. It comes with cushion handle and 360 degrees swivel access. This V-shaped yoke leg’s tips are strong enough to hold a place very well even in rock or softer surfaces like grass or dirt. 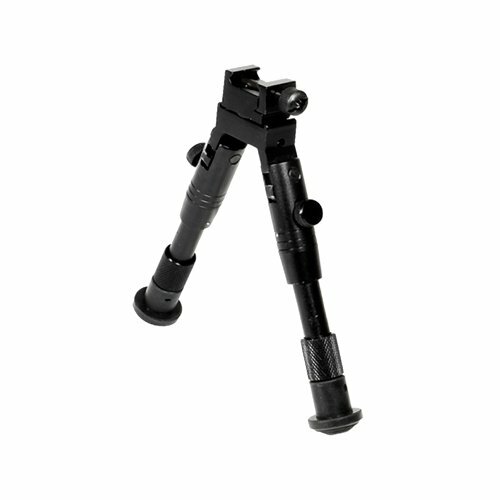 This is a lightweight and compact bipod that easily release legs into four section. The clip-on legs and cushioned hand grips help to fix the legs with comfort and minimize the sounds. Each part of this bipod leaves the flashy add-ons off and maximizes the efficiency and usability. Everything of this bipod is practical for actual field use and ideal for big game hunting scenarios. This is a perfect one to hold your rifle without stress. B62 is a lightweight bipod which constructed with durable aluminum alloy. This v-shaped bipod with easy and quick adjustment function is designed for the on-the-go hunters. In hunting, you never know what types of shots you are going to get. And so, professional hunters love to carry a set of tactical bipod or shooting stick to get steady and secure shots. These kinds of shooting sticks provide perfect shooting power and stability to get real security. To choose a good bipod as your requirements, it is important to consider the scope as well as the way you intend to use the bipod. And so, it is better to know about different types of bipods before picking out one for you. Here, we cover 10 best tactical bipod’s review with their pros and cons to let you know about bipods and to help you purchase the best one with confidence.